A performer who sells children’s balloons on Madrid’s Puerta Del Sol, the central square of the city, has admitted that earlier this week, during the Chinese President Xi Jinping’s working visit, he was asked to depart as Spanish authorities didn’t want to risk offending the Chinese government. It is once again another ridiculous chapter in the Winnie The Pooh versus Jinping story. Chinese president Xi Jinping visited the Spanish capital Madrid on Wednesday, which meant that the street artist could not perform his job for half an hour. As a precaution he had to leave his workplace at the central square Puerta del Sol. On the square is also the town hall, where the Chinese president was received. The sight of Winnie the Pooh could well be considered offensive, Spanish media write. Xi Jinping is compared on social media with the iconic yellow bear since his visit to the White House in 2013. A photo with a walking Xi Jinping and then US President Barack Obama went on to lead a life of his own. Jokers saw a striking resemblance with a Disney illustration showing Winnie the Pooh and Tigger. Since then Winnie is the Pooh persona non grata in China. 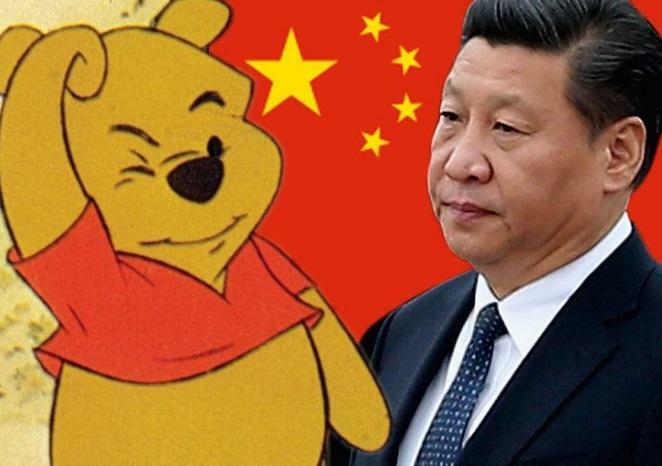 Critics who try to circumvent the Chinese intensive government censorship on the internet regularly post images of Winnie the Pooh to criticize the regime. All references to the yellow bear have been removed at the Disneyland Park in Shanghai. The most recent Winnie the Pooh film has not been released in China at all. The street artist who folds balloons and poses for photos in exchange for a tip, agreed with the decision. The security forces also wanted to avoid at any cost that ‘Winnie’ would appear on a photograph showing Xi Jinping. Singlemindedly united as one under invincible banner of Xi Jinping Ideal held aloft by Dear Leader Comrade Generalissimo Xi Jinping, brilliant statesman, political genius, and invincible military commander, Glorious China will persevere over all worthless nations ruled by inferior and mongrel races and bring them under the glorious five-star flag. Ten thousand years!